Just because you’re without a job or pinching pennies doesn’t mean you have to make like a Cratchit for the holidays! I realize I am late to the party, but I also know lots of people have holiday events this weekend and next–including MPS. I still don’t know what (to quote my mother), “I’m gonna put on this body”, but it’s got to be something cheap or something I already have in my closet. So after thumbing through my wares, I’ve come up with five easy (read: not groundbreaking) style ideas that are sure to erase the bah-humbugs and have you eager to make out under the mistletoe and go buck-wild at your office holiday party! 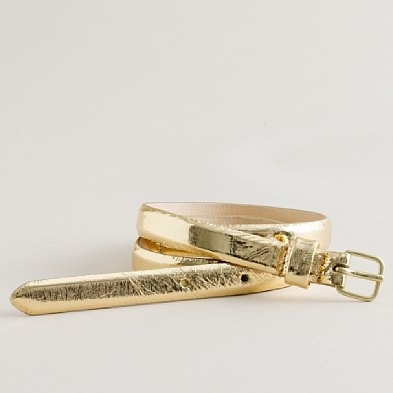 Glam up a simple outfit with a silver or gold skinny belt. J.Crew has some sassy metallics for little $$$. Buy some inexpensive costume jewelry to bring back to life that little black dress or silky top you’ve been wearing to death. Was floored by the fun selection I saw the other day at Old Navy. Granted, these baubles may not last forever, but at least they’ll add a lil’ bling for the night. Target. Target. Target. Their Limited Edition line is bursting at the seams with cuteness. Borrow from a friend. Act like you’re living back in the dorm or the sorority house. There’s nowhere better to shop than your BFF’s closet. Just be kind and dry clean before returning. USA Today ran a great story on the state of designer jeans in today’s paper. Until recently, the recession hasn’t dramatically impacted sales of premium denim. Now, however, uber-pricey brands aren’t seeing growth while companies such as Levi’s, Lee and Wrangler are still experiencing rising sales. It has always suprised me that women fork out $100+ for jeans, but I guess when you employ the cost-per-wear formula, that results in “value” for many who wear the pants off of their J Brands and True Religions. I love my jeans, but you do NOT have to spend $200 on denim to look like a star. I own a few pairs of Joe’s Jeans, J Brand and AG, but I buy them at Filene’s or Nordstrom Rack, where the options may be from last year, but they’re also still in style and have a price tag of anywhere from $39 to $99 – much less than retail costs. I also supplement my denim wardrobe with less expensive, yet no less fashionable, pairs of jeans from J. Crew, Old Navy and others. H&M, Uniqlo and even Target have incredibly reasonable options, too. All of these pairs still have high-end lycra technology and come in great washes and cuts. Believe me. Less pricey jeans look just as stylish as their premium counterparts when they have a good fit and are paired with a cute top, cut-appropriate shoes and darling accessories. Have you quit buying expensive jeans during the recession? What are your favorite cost-conscious options? Mother’s Day is in six days. You may be broke (aren’t we all?) and jobless, but Mom still needs to know you care. And, believe me, Mom knows the situation you’re in and doesn’t expect you to buy a big gift. You can honor her with something cheap, and that doesn’t have to mean crappy. It can be creative and very charming. These are often the gifts that take the most thought, and Mom will be so happy you didn’t let this day pass without some special token of affection. A bouquet even Martha could love – Buy a couple of bunches of brightly colored tulips from your corner deli, farmer’s market, grocery. Tightly arrange without any filler in a simple vase. Tie raffia around the vase. Voila! You’ve got a simple, classy floral arrangement that probably cost you no more than $25 and looks like Martha. Beach bag bingo – If your mom is a beach bunny, put together her beach bag for Summer 2009. Old Navy has the CUTEST canvas floral bags for $12.5o. Fill with a paperback, beach towel (you can get these for $9.99 and less at TJ Maxx, etc. ), SPF 30+ sunscreen and, perhaps, for laughs, a $2.00 pair of huge, obnoxious sunglasses that remind you of her days carpooling in 1979. Give to her favorite charity – Donate what you can ($10, $15, $20) to a cause that makes Mom smile. Put an acknowledgement in her Mother’s Day card. This is ideal for those Moms – like mine! – who give tirelessly of themselves to every one, every day. This is also ideal for you, because Mom won’t have to know just how much you gave. Take Mom to a matinee – Take mom to a matinee movie (they’re cheaper!) and for ice cream after. The whole bill might be $25 (unless you’re in NYC), and she’ll be thrilled you chose to spend a precious weekend afternoon with her. Sometimes a card says it best – You may not be able to get her a gift, but you can buy the best card you can afford. Many greeting cards these days are beautiful and look like gifts themselves. Check out Kate’s Paperie, Papyrus, Sam Flax and Target all have gorgeous high-end cards. I also love the eco-friendly greeting cards with flower seeds built into the paper. My mom thought that was too cool. BONUS TIP: Get your siblings to chip in on a gift for Mother. You can get something nicer, and your mom will be too happy that her kids worked together in peace and (relative) harmony. Believe me, I know the last thing you can do is buy a new suit for a job interview. But, so metimes, new togs can be just the lift you need to keep confidently networking and interviewing. Solution! This adorable suit on OldNavy.com (not available in stores) is a clean-lined, cotton twill shift dress plus matching jacket. Comes in black and khaki. The dress is $29.50; jacket is $39.50. It’s basic enough that both pieces can be worn and accessorized in 100 different ways. You will look put together, modern and fresh. Who wouldn’t want to hire you in this?